Fish Finger Sandwich: Retro Biscuit Ice Cream #3 - "Orange Club"
I'm not really a 'social media' type of fellow. I supposed I'm just too busy coming up with ridiculous dishes to spend time engaging with the twitterati. But when my PR representative took to Twitter to ask my numerous fans what retro biscuit they'd like to see turned into an ice cream, I was deluged with responses. While I'd love to make all of them, it would take me literally most of the morning. So I've just picked one for now - the orange Club. 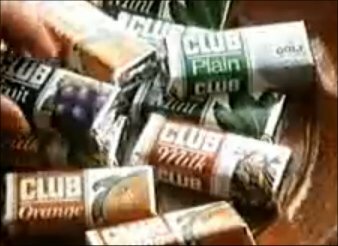 I've always liked Clubs, the layer of chocolate was pleasingly plentiful, and the biscuit was satisfyingly crisp. They now come in four flavours - milk chocolate, fruit (raisin), orange, and mint. But back in the day, there was also a plain chocolate variety with a golf ball on the wrapper. Now why, I ask you, would they put a bloody golf ball on the packet? What's all that about? 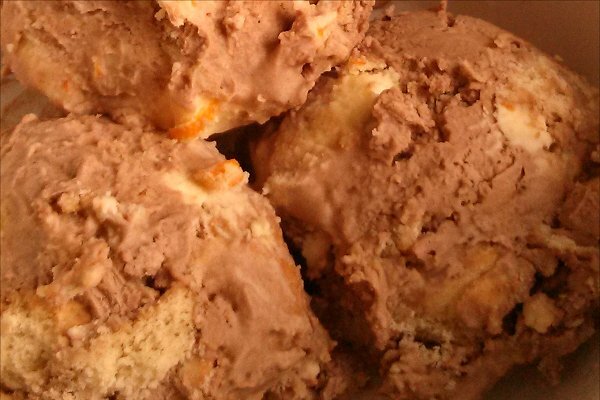 Anyway, for the orange club ice cream, I decided that the best approach would be to make two separate ice creams - chocolate and orange - and sort of swirl them together with biscuit chunks. I'd recently read about a way of making ice cream by simply whipping up double cream with condensed milk and putting in the freezer, so I decided to use that approach for this project. 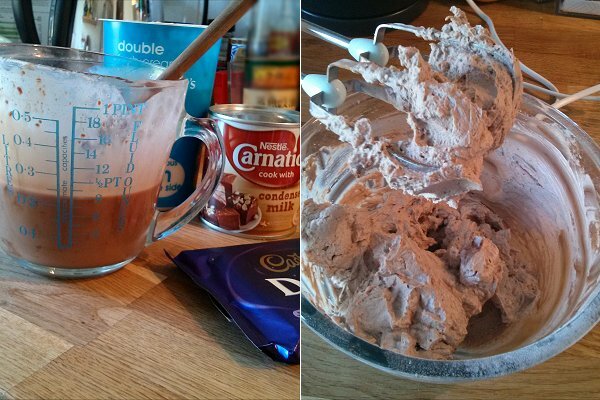 For the chocolate ice cream, I melted some milk chocolate with a bit of cream, and then when it had cooled, whipped it up with some more cream and some condensed milk. For the orange ice cream, I added some orange rind and a little marmalade to the cream / condensed milk mixture, and whipped it up in the same way. I put alternate spoonfuls of the two ice creams into a plastic tub along with pieces of shortcake, mixed it about a bit, and put it into the freezer overnight. 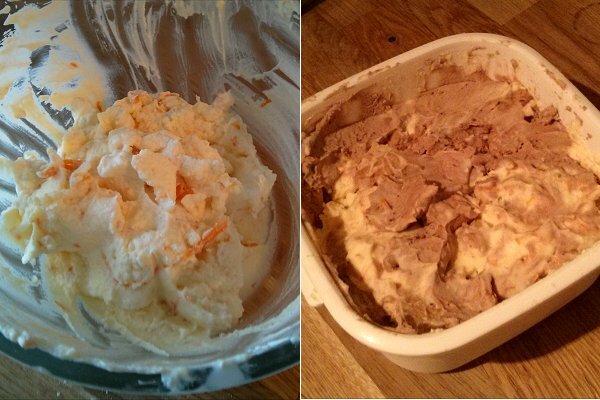 It looked a mess in the tub, but actually looked pretty damn good when served in scoops. In honour of the Club's thick chocolate coating, what better way to serve this than with a topping of my home made chocolate orange 'Ice Magic'? 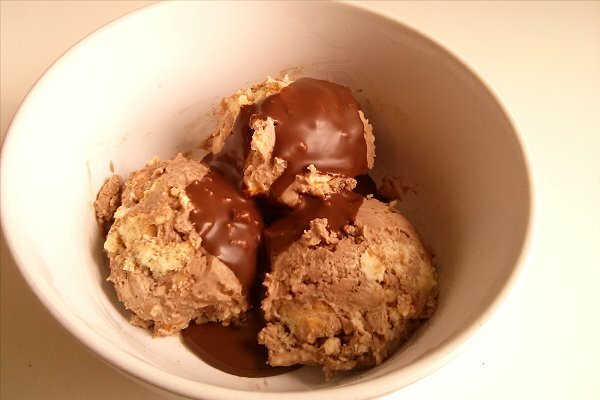 I'm not 100% sold on the cream and condensed milk method of making ice cream, though. The texture didn't seem quite right - not rich and dense like a custard ice cream, nor did it resemble a soft-scoop ice cream. It was a litte bit... crumbly. Maybe a fancy restaurant would call it an "iced parfait" or something. It still tasted pretty good thanks to the awesome flavour combination, but I reckon there are better ways of making ice cream!